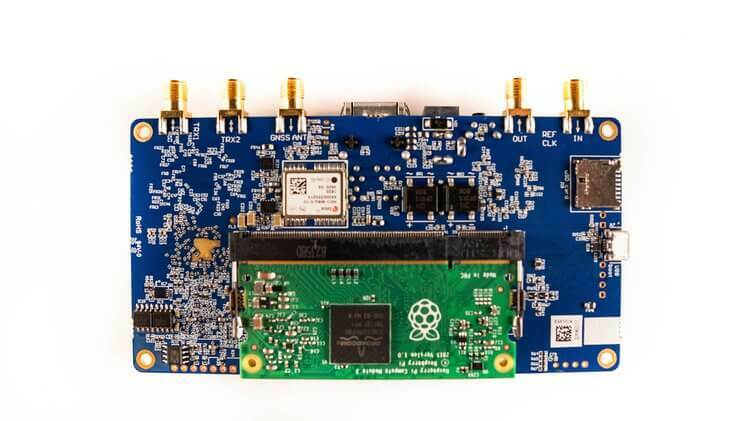 Lime Microsystems, creators of the LimeSDR, LimeSDR Mini and LimeNET SDR devices have recently begun crowdfunding for a new product they are calling LimeNET Micro. LimeNET Micro is described as a software defined radio platform with an integrated processor for creating self contained wireless networks. In other words it is a LimeSDR LMS7002M SDR transceiver chip with an included Raspberry Pi Compute Module 3, FPGA, GNSS module, EEPROM and Flash memory attached to it. The LimeNET Micro is capable of full duplex TX and RX (1 port each) with the typical LimeSDR frequency range of 10 MHz - 3.5 GHz. However a major difference is that the LimeNET Micro is only capable of a 0.27 MHz bandwidth, whereas other LimeSDR products are capable of bandwidths up to 30.72 MHz. One interesting additional feature is that the LimeSDR Micro comes with a GNSS module that can be used to receive GPS/GLONASS etc for high accuracy timing if required. The price is $269 USD and this includes a Raspberry Pi Compute Module 3. Higher end kits can be purchased which include Acrylic ($399) or Aluminum enclosures ($459). LimeNET Micro with Raspberry Pi Compute 3 Module attached. It really does depend on the application, if it is higher performance or not. SPI at 1.0 MSPS has a latency of 1 μs with very low jitter. USB 3.0 has an average (one way) latency of 30 μs with low jitter. USB 2.0 High speed has an average latency somewhere between 1ms to 300 μs depending on a very large number of factors, including hardware, drivers and OS. I should probably add that I think, not sure, that the correlation of GPS and RF could be done inside the FPGA. Since the output of the u-blox NEO-M8Q-0-10 and the LMS7002M both feed into the FPGA. The Intel Altera MAX 10 (10M16SAU169C8G) on paper can generate clocks up to 450 MHz so it might be possible to have much higher distance resolution, with lower jitter. But you would still be limited by the sample rate of the LMS7002M and the timepulse jitter of the u-blox M8 (which would will be around 21 nanoseconds – https://twitter.com/LeoBodnar/status/1050482625515786240 ).